Thunder Bay First Aid is one of the leading training service providers of workplace approved certification programs in the area. High quality programs are offered at very affordable rates and flexible schedules. Because of these great offers. Thunder Bay First Aid has remained the most popular provider chosen by students in Thunder Bay. You can find a complete list of available classes here at the Thunder Bay First Aid website. After you have chosen a training program, you can use the form below to register for it. Trainees are likewise encouraged to complete their enrolment through e-mail, telephone call, or walk-in during business hours in any of the training centers in Thunder Bay. Thunder Bay First Aid training classes are offered at the most affordable rates in Thunder Bay. Trainees only pay the fees once – the initial enrolment fee – which is inclusive of taxes, certificates, workplace approved registration fees, and training manuals. Trainees who drop out are entitled to full refunds, provided a 72-hour notice is given beforehand. All of the classes at Thunder Bay First Aid are taught by workplace approved certified instructors in high end training centers. The centers are easily accessible because they are all within walking distance to free parking and public transportation. The classrooms are spacious, well-maintained, and decked out in the latest training equipment as well. 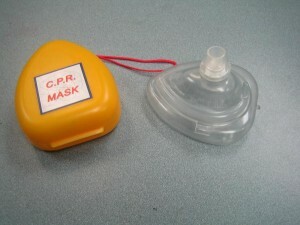 Chest compressions on a CPR training mannequin. Cardiopulmonary courses (CPR) are available in three levels at Thunder Bay First Aid. Each level includes basic first aid and automated external defibrillation (AED) training. AEDs are machines that are attached to the heart, detect heart rhythms, and apply needed shock to restart the heart. 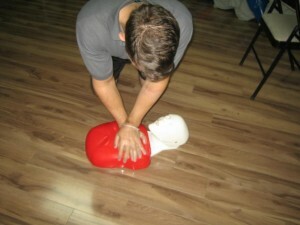 Stand-alone classes for CPR and first aid are also available if you do not want to enrol in the full training course. Stand-alone CPR classes also include AED training, as per the latest guidelines by the American Heart Association. Classes are Thunder Bay First Aid will teach trainees who to perform chest compressions, give rescue breaths, and perform other basic first aid skills such as bandaging and wound care. Private classes are available as well but are usually taken by big groups of trainees or companies. You can send an e-mail or call Thunder Bay First Aid to inquire about booking private classes. Training certificates from St Mark James are awarded to trainees who are able to complete a training course. The certificate is valid for three years and may renewable through refresher / re-certification programs held twice a week at Thunder Bay First Aid. Prerequisites must be met prior to registration. First aid kits should be in every home, whether or not you have small children who are prone to accidents. Accidents can occur at the most random moments and it is best to be prepared. Being a trained first aid rescuer, you should always have a small kit in your home to help your family members, friends, and neighbors if the situation calls for it. Children should also be taught very basic skills and know where the first aid kit is. We should all be responsible for our health and keeping ourselves and others safe so be sure to have a first aid kit in your home.